What is it about certain individuals that inspire not only themselves but also the people around them? In her recent book, Be: Become Your True Self, And Inspire Those Around You, author and branding expert Bahriye Goren-Gulek explores that certain sense of being that comes with deeper levels of awareness — which ultimately turns ordinary leaders into inspiring leaders. As human beings we are known to be notorious storytellers. Our whole life experience is based on the stories we tell ourselves. Think about it. Isn’t every experience you recall a personal commentary, a thought, a perception, even an interpretation of occurrences? Two people can attend the exact same concert yet have two completely different thoughts about it and, as a result, two totally different stories to tell afterwards. You probably describe the last company outing very differently than some of your colleagues or team members might describe it. And what happens when we add the opinions and expectations of people around us to our own thoughts? The mixture of all these thoughts and opinions becomes our story and description of who we are, or who we think we are. Our thoughts create our stories, which in turn create our life – or rather, it creates how we experience our life. This same principle applies to the workplace. I’ve worked in environments where people are governed by fear. And guess what? Most likely, the leaders in those workplaces have many fears within themselves. We all know the insecure overachiever profile. I was even recruited by one of my first employers because I was one of them. But when an insecure overachiever gets to be in charge, they will demand the same work ethic from the people who work for them. I can guarantee you fear is never the best adviser. has shown different patterns of brain activity in high-insight versus low-insight anagram solvers, when people are completely at rest. The key conclusion was that insights do not come from logical reasoning, but are a sudden knowing that pops up in a restful state. They emerge out of a moment of nothingness. They emerge from what I would call intuition. So how do we tune into this magical source called intuition? It is actually simpler than you might think, yet at the same time, its simplicity is also one of the hardest things to achieve, especially in our digitally ‘always on’ society. First of all, it’s important to realize that your intuition is already present. It’s inside of you, so you don’t need to go anywhere or do anything! I have participated in many corporate and self-help training programmes out there, seeking tools to become a better person. Drumming sessions to build better teams and drum out the frustrations? Why not? Phrases like ‘limiting beliefs’ and ‘growing edge’ are thrown at you from all directions. I’ve seen colleagues break down, weeping, in some of these workshops, because they feel lost. It was only after I took a break from going to these workshops that I could see what the main learning point was. The key is to remove the barriers we have put in place, versus searching to find that holy grail as if it is something outside of us. Over the years, we have become so skilled at protecting ourselves, our image, our status, that in the process we have also killed that which makes us the best leaders: our inner wisdom. We have become externally driven versus internally driven. You must recall those moments where you feel this tinkling in your gut. When all of a sudden you get an idea, or you are interviewing someone for a job and you know that it’s a bull’s eye. You just know it! So how to bring back what we seem to have lost? You get your intuition back when you make space for it, when you are able to silence the mind. The word ‘mindfulness’ has become extremely popular these days, giving it both a mystical as well as an unreachable status. Nothing could be further from the truth. It basically comes down to being able to stop thinking, stop talking, stop doing, and listen. Still the rational mind. The mind that society has put on a pedestal, where we think we can outsmart life. But the fact of the matter is that the rational mind doesn’t know everything. And, often, it can hinder us to find the right answers. while in motion. Be still. Be: Become Your True Self, And Inspire Those Around You by Bahriye Goren-Gulek is available in both Kindle and Paperback version via Amazon. In her recent book, Be: Become Your True Self, And Inspire Those Around You, author Bahriye Goren-Gulek draws on her 15 years of global experience as a brand strategy expert to inspire readers to achieve deeper levels of awareness in order to transform ordinary leadership into extraordinary leadership. 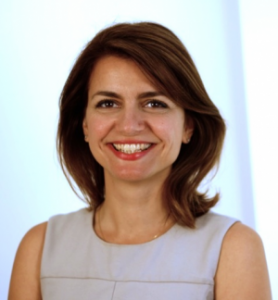 A seasoned brand strategist, Goren-Gulek has worked on both the client (Unilever) and agency side where she has consulted world class multinationals across the globe. As the former Executive Director of Innovation and Strategy at Wallace Church & Co., an award winning branding agency in New York, she has worked with the most talented creative and brand leaders. She is a university lecturer at the graduate and undergraduate level at business schools in New York, Colorado, Singapore and Taiwan. She lives with her husband, son and their dog in Boulder, Colorado. "An understanding heart is everything in a teacherâ€¦ One looks back with appreciation to the brilliant teachers, but with gratitude to those who touched our human feelings. The curriculum is so much necessary raw material, but warmth is the vital element for the growing plant and for the soul of the child." We have teachers all throughout our lives. I can remember just a handful of the ones I had while I was in school, and that is because I knew that they cared about me. As an adult, I studied at The Healing Arts Center, and my teacher there was Louise Taylor. I am so grateful to Louise for sharing so much of her knowledge and wisdom with me. And she taught me, and all of her students, by example as much as by her classes. Louise is a wonderful, caring, compassionate mother, friend, and businesswoman. She radiates integrity, creativity and love. Those are qualities of a good teacher!